Britain’s membership of the European Union (EU) will be put to a vote in a referendum on the 23 June. The leading figures on either side of the debate are unappetising in the extreme. On one side stands David Cameron and the bulk of big business, on the other Nigel Farage and the Tory Eurosceptics. Both sides are steeped in racism and both sides present arguments focusing on the interests of British capitalism. The left has strong reasons of its own for opposing the EU, in particular the EU’s commitment to neoliberalism and its construction of a “fortress Europe” barring the entry of migrants. For socialists the challenge is to build and anti-racist and internationalist case for exit, independent of our rulers. Come along and join the debate on 8 June. 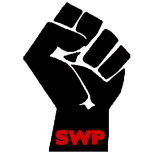 This entry was posted on May 22, 2016 by leicestersocialistworkersparty in Meetings, Uncategorized.